First Choice Physical Therapy: Marathon success! The beauty of reaching your goal! This is day two after the 40th BMW Berlin Marathon. My legs are still very sore after successfully completing the 26.2 miles, but it was all worth it! The whole weekend was a big celebration with over 40.000 other runners. 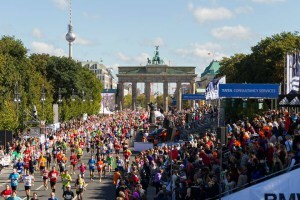 The city of Berlin was certainly filled with the running spirit! A special shout out to our very own Brent Holtgrewe, ATC (Sports Enhancement Specialist), who was a big part of my lunch break training. The soreness will disappear but the experience, the memories, and the medal will stay. Thanks for all of the support! I am a FINISHER!